Located at the mouth of the Taunton River, Borden Flats Lighthouse has protected the waters of Mt. Hope Bay and Fall River for well over a century. On October, 1 1881 the lighthouse became active with a fixed red light from a 5th order Fresnel Lens. The lens was later upgraded to a 4th Order Fresnel Lens. Today, the lighthouse is undergoing a transformation. After 48-years, the lighthouse once again has a caretaker. The exterior of the station has undergone a long awaited facelift. 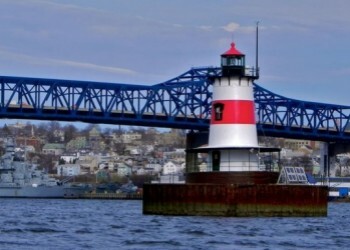 By popular demand, the local boating community wanted to see a change in the lighthouse to help make it more visible against the Braga Bridge supports, the city of Fall River and the towers of the Brayton Point plant. The beacon now proudly displays a red lantern roof and red sectional band. The white on the tower was increased to a brighter white. Lighthouse lovers can spend the night. 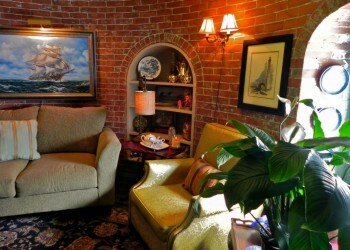 A night stay is $300+ and includes transportation to the lighthouse. Upon numerous occasions, visitors and owners, have heard the sounds of a little girl giggling, a man whistling and waves of classical music drifting at night through the lantern room. There have been numerous occasion of hearing a "thud" on the floor below, or the sound of people coming into the lighthouse while you're working upstairs, only to find that no one is there. New England Ghost Project, as well as, Southern New England Paranormal, have conducted night investigations. 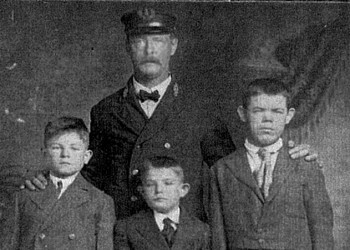 Both groups have discovered the spirit of Captain John Paul, the keeper of the light from 1912-1927. Along with John Paul, the spirit of a 10-year old boy and 9-year old girl have been detected. Borden Flats is still their home, and they seldom make their presence known to the over night guests.